Did you watch Jason Brown’s (USA) SP last night? The 19 y.o. boy-next-door performed VERY well, impressing BOTH the crowd & judges at Sochi. This couple just WOW-ed the audience (and judges) with their steamy, fast-paced, and technically superb flamenco! Tessa used her long red skirt very skillfully as a prop; Scott’s expression was TERRIFIC throughout the dance. At the end of the OD, V&M took the lead. This is one of the MOST well-choreographed ODs I’ve ever seen! V&M went “old school” w/ a very sweet/elegant FD with one piece of romantic music. Their costumes were very simple, yet beautiful. The audience fell in love with them as well! In the OD, Davis & White wore lovely Indian-inspired outfits. They danced to music from Bollywood movies, including the international hit Devdas. In a interview on the NBC web site, Charlie mentioned that they both took a classical Indian dance course to prep for their dance. Meryl was proud that many in India were watching (and commenting positively) about this program on YouTube. Very cool! 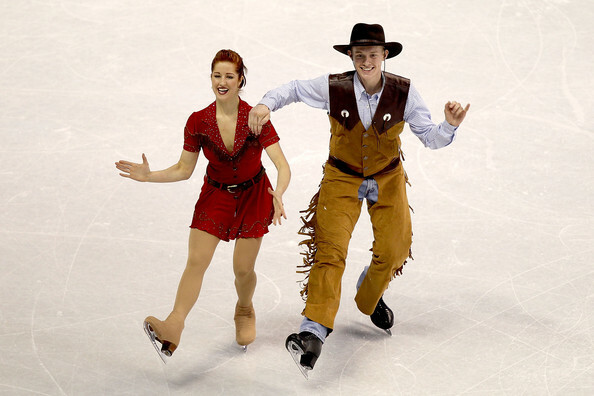 Watching these young North Americans, I was reminded of ground-breaking couples from the past: Marina Anissina & Gwendal Peizerat (my favorite team- from France), Isabelle & Paul Duchesnay (brother-sister team from France), and Jayne Torvill & Christopher Dean (the famed duo from Great Britain). These teams paved the way for this confident new generation with their creative lifts, innovate choreography, and dedication to improve their sport (with OR without a medal). I wish Tanith Belbin and Benjamin Agosto got the bronze medal this time; in 2006, they won the silver. That judgment would have been fair, but it was NOT meant to be. 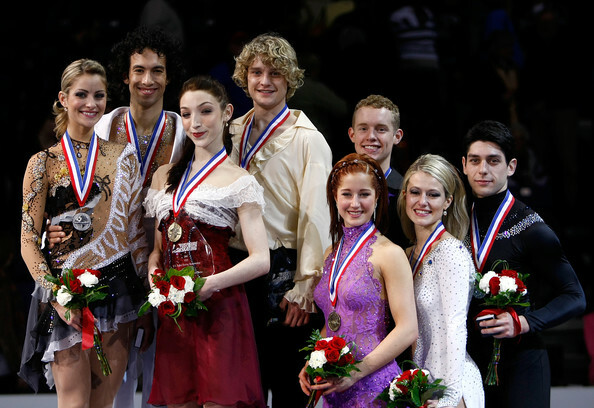 B&A have contributed a LOT to ice dance over the last decade; it was FUN to watch them grow up and improve. They were the first U.S team taken seriously at the international level. These were the first Olympics I ever watched! I have a few vague memories of that time (since I was just 9). I went to YouTube recently to look back at some programs. A VERY well choreographed/fast/fun program revealing Orser’s personality, as well as skill. He was ahead of Boitano after the SP w/ this program. Who knew a SP could ALSO be this artistic!? This was the gold medal-winning performance choreographed by Sandra Bezic (now a NBC commentator). As you will see, it was ALMOST flawless. 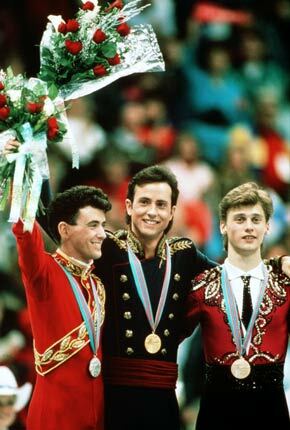 Boitano was the total package, and then some IMHO. He created the ‘Tano lutz: a triple lutz with the left hand poised above the head. Besides his jumps (he’s the first American to land the triple axel) and spins, Boitano had a GORGEOUS spread eagle (another one of his signature moves) and TRULY felt the music. It was “too close,” as Orser says after he gets silver. He was the first man to do 2 triple axels at a major competition (1987 Worlds). Before the Brians in ’88, it wasn’t common to see 2 triple axels in one program. They BOTH set new standards for excellence, technically and artistically.